Needs some free or cheap spring break ideas? Here’s a list of fun, inexpensive places to visit during Spring Break in and around Louisville. If you are staying around Louisville or visiting for spring break, there are plenty of opportunities for fun that are either free or cheap! Here are 18 for you to choose from. 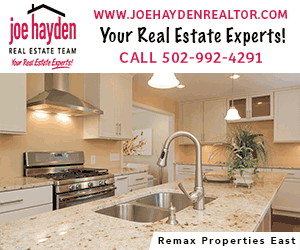 Visit Yew Dell Botanical Gardens Tuesday-Sunday this spring. Yew Dell offers the public exceptional display gardens, an ambitious slate of education programs and community events, ongoing garden plant research, hiking trails and event rental opportunities. Adults: $9, Children 6+: $5, admission for children under 6 is free. This is a great deal if you have preschoolers! The Falls of the Ohio State Park is located on the banks of the Ohio River in Clarksville, Indiana at I-65, exit 0. The 390-million-year-old fossil beds are among the largest, naturally exposed, Devonian fossil beds in the world. The park features a spectacular Interpretive Center overlooking the fossil beds containing an exhibit gallery and video presentation. If you skip the interpretive center and just explore the fossil beds, it’s just $2 to park and you can still go into the center to ask for a fossil map for free! Pack a picnic! The Carnegie Center of Art & History offers free admission and is open Tuesday-Saturday 10:00am-5:30pm. Then, visit the vibrant downtown area of New Albany for shopping or dining, or venture to a nearby New Albany park for a picnic and play time. Head to Rebecca Ruth’s and see where the world famous Bourbon Chocolates is born. Known worldwide as “The Inventor of Bourbon Candy!,” it is close to the Kentucky state capitol building which allows for some sweet educational fun. Take a tour and sample some yummy candy! $5.00 per person, free for children 5 & under. Guided tours are Monday – Saturday 10:00 AM – 12:00 PM & 1:00 PM – 5:30 PM. Salato Wildlife Education Center has something for the entire family! While touring the grounds, you will see native wildlife up close and personal along their paved exhibit trails. Bring a lunch and have a picnic, bring fishing gear and go fishing at one of their stocked lakes, or take a hike on one of their trails! Adult: $5, Youth (5-18): $3, admission is free for kids under 5! They are open Tuesday-Saturday. And, there’s a nice playground just down the street at Juniper Hill. Click here for more ideas about a day trip to Frankfort. The Kentucky Children’s Garden is a safe 1.85 acre outdoor learning environment designed to help children 2-10 years old discover plants and the environment. There’s an integrated combination of various “child-scaled” theme gardens and garden-like elements for experiential play: gardens planted and maintained by children, a small amphitheater for presentations, interactive educational exhibits, interconnecting paths and comfortable benches. $10 for a family of 5 or $3 per person, under 2 years old are free. Closed Mondays-Wednesdays during the spring. Tour the Toyota Plant. It’s for kids who are in first grade or above and they have tram tours and interactive features that kids will love. Bernheim Arboretum and Research Forest has lots of classes and trails to explore. It is free Monday-Friday and only $5 for passenger cars, minivans, and motorcycles on the weekend. Visit Abraham Lincoln’s Birthplace. Begin your journey at the Visitor Center and view the Bible that belonged to his father and mother, Thomas and Nancy Lincoln, watch a 15 minute video about his early years, and follow the “Pathway of a President” plus lots more. If you want the day planned out for you, here’s a day trip itinerary! Take a walk over the Big 4 Bridge and bring a picnic to share with your family and friends. This is a fun and cheap way to spend a beautiful spring day. Splurge a bit have lunch/dinner at one of the yummy restaurants in Jeffersonville! Bring this trivia sheet with you to work on together. Bonus idea: Painting at Whet Your Palette! Louisville Free Public Library branches offer loads of fun to explore during Spring Break! Find more information here about classes being held near you. Bonus idea: Renaissance Fun Park has a $20 all day deal! 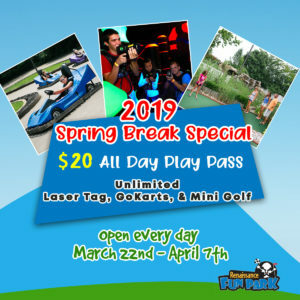 Unlimited laser tag, mini golf and GoKarts! Parklands of Floyds Fork, Iroquois Park, and Cherokee park are just a few of the great parks within Louisville that have loads of fun ready to be found within! Wednesday Wonders at the Parklands of Floyds Fork are interactive programs designed to spark the curiosity of young children. Each week, they explore a new science wonder with a story, craft, hike or related science experiment. See all events here. If you are ready to be brave, take a trip to the Extreme Park downtown! The Louisville Extreme Park is one of the nation’s best skate parks, with awesome features, including a 24 foot full-pipe! The park offers a great balance of street-style, transition style and vert. Get your exercise on the Louisville Loop. The Louisville Loop is an estimated 100-mile trail system that will eventually encircle the city and link existing and new parks and neighborhoods to civic attractions, transportation alternative and recreation opportunities. Make sure to check the website for any closings. Riverside, the Farnsley-Moremen Landing is part of Louisville Metro Parks and so rich in local history. They do have special events that are fun but they are also open to the pubic so you can explore and learn over spring break. Great picnic spot too. The original home is there and very interesting as well as active archaeological digs going on to learn more about the people that have lived on that site. There’s a family rate of $15 so you won’t be spending a ton if you have a big family, otherwise – the individual fees are very reasonable too. If you are looking for a unique way to learn history, download a map and explore Cave Hill Cemetery. It is known for its exquisite collection of monumental art, many examples of which are over 150 years old. Additionally, the property includes a variety of historic structures, from the Administration Office to the Board Room to the three and half miles of brick and stone wall that encircle the perimeter. Museum of American Printing House for the Blind offers free self-guided visits to the museum which allows visitors to explore at their pace. Those who want to see the factory in action and learn more about how products are made may take a guided tour that combines braille and audio book production with the museum visit. 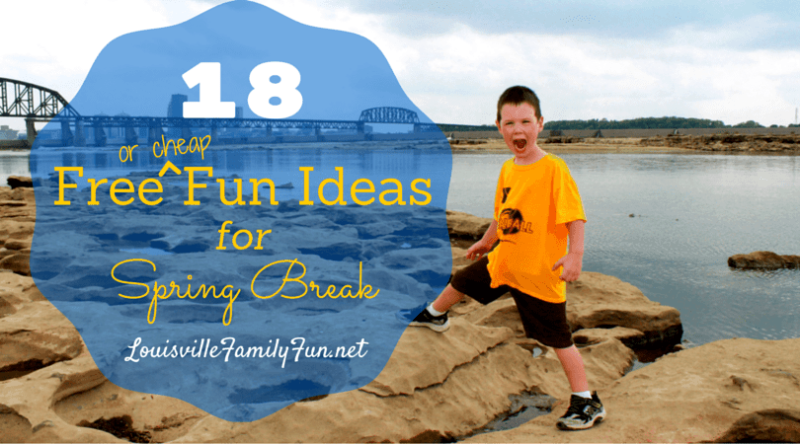 Be sure to keep tabs on our Spring Fun links for MORE Spring Break ideas!